Editor Note: this article is second in a series about the 1981 Imperial, for Part 1, please see 1981 Imperial – Chrysler’s Ultimate Luxury Coupe. Many classic car enthusiasts have a dream of owning an absolutely perfect example of their favorite classic car. They spend countless hours and mucho dollars to make this dream happen and even when they do, they usually fall short. No matter how perfect a car is there are usually imperfections or slight wear and tear. If you are unfamiliar with this concept of owning a classic car in perfect condition, then close your eyes and just imagine going back to when a particular classic car was brand new and visualize driving the car right off the dealer lot with single digits registering on the odometer. Smell the new car aroma, view with your eyes the absolutely perfect interior and exterior with no wear. Walk around the car and smell the new rubber smell from the tires. By now you probably get the point. To get to this place there are two solutions, you either find a classic car and go all out with a "no holds barred" concours style restoration (which can push the cost of some projects as high as six figures) or you find a unmolested low mileage original car that was pampered and somehow miraculously preserved from the harsh life most cars lead, to remain in perfect condition. As most have found out the latter is the more difficult to obtain, especially when your heart is set on a particular car equipped with certain options, exterior color, or interior color. If you happen to stumble on one of these immaculate untouched time pieces, you are stuck with the way it came from the factory which in some cases may not be how you would have ordered the car. And if it happens to be painted from the factory with an unattractive pea green exterior color, well that’s the way the cookie crumbles. And then there’s that classic car buyer who happens to be as lucky as a leprechaun finding that proverbial "pot of gold" at the end of the rainbow. 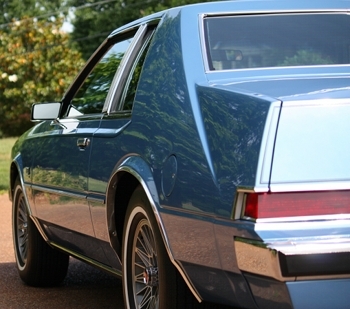 One such person is Michael Costik, who owns an absolutely pristine 1981 Imperial. This car may be off most collectors’ radar however it has everything to win the hearts of even the harshest of critics. After-all Costik’s 1981 Imperial still flaunts its perfect Day Star Blue Crystal Coat exterior paint color which is still breathtaking even after 31 years, and the perfect all original condition Navy Blue Mark Cross leather interior was the finest quality of leather you were going to find around the time of the beginning of the Reagan Presidency. Costik’s car is so perfect with no apparent wear that you could teleport it back to 1981 and it would be right at home on the showroom floor of any new Chrysler dealership with customers never suspecting this car has seen 31 years of service. And the thick plush carpeting which is one of the first places a classic car shows wear is just as perfect as the day this car rolled off the assembly line. Even by today’s luxury car standards it looks so regal in appearance it even puts a new Maybach’s carpet to shame. Costik is no sthrysler rangler to Cproducts. The root of his love affair with the 1981 Imperial started when he purchased in 1985, a 1982 Chrysler Cordoba which was Chrysler’s bread and butter 2-door personal luxury coupe from 1975 to 1983 – a car that Chrysler pitchman and actor Ricardo Montalban made into an icon of the 1970s. 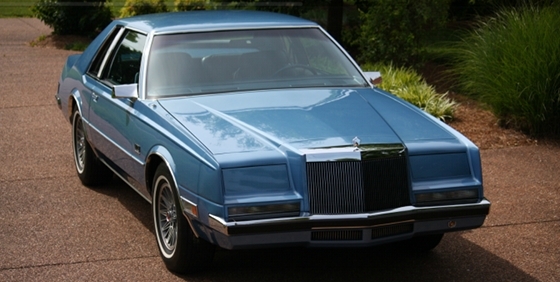 The 1980-1983 Cordoba along with the 1980-1983 Dodge Mirada (both 2-door luxury coupes) shared the same platform as the 1981-1983 Imperial. However Chrysler wasn’t willing to admit that fact since it advertised the 1981-1983 Cordoba and Mirada as being built on the Chrysler J-body and the Imperial being based on the Y-body. Of course this helped to peddle the speciality aspect of the Imperial which Chrysler was trying to convey – that this was no ordinary Chrysler but one so special it was just referred to in advertisements as the "Imperial" (just like the old "Imperial" luxury car division of Chrysler which had been shutdown due to faltering sales at the end of the 1975 model year). The Cordoba and Mirada may have shared some common parts and the overall exterior design theme with the Imperial, but the Imperial was in a much higher luxury league of its own. Where the Cordoba was a fine luxury car and was everything that a famous actor such as Ricardo Montalban desired – you may remember Montalban declaring in a mid-1970s TV commercial that "in Cordoba, I have what I need". However the overly opulent Imperial was higher up the luxury ladder and needed an even bigger name to represent it. That’s where Frank Sinatra, who is the most famous crooner to ever sing into a microphone and one of the biggest celebrities on the big screen back in his day, became the quintessential representation of the new 2-door Imperial. Not only was there a special edition 1981-1982 Imperial called the Frank Sinatra (FS) Edition, but he even appeared in ads and sang in a TV commercial, a song called "It’s Time For You" which praised the luxury offered by the Imperial. Sinatra due to Chrysler’s financial difficulties at the time agreed to do Chrysler advertisements and TV commercials for only $1 a year. Lee Iacocca the President of Chrysler at the time, to show his gratitude gave Sinatra the first 1981 Imperial off the assembly line in a special ceremony on August 11, 1980. 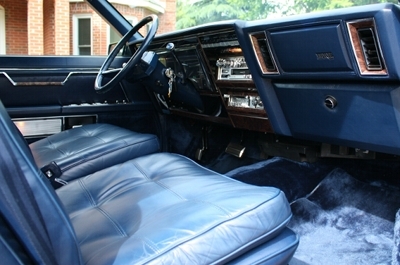 The 1981 Imperial when it was released wasn’t just intended to be the most upscale 2-door Chrysler offered but the most opulent American 2-door 1981 model year luxury car. And its base price of $18,311 was substantially higher than the best 2-door luxury coupes the other two big American automakers had to offer – the 1981 Cadillac Eldorado (base price of $16,492) and the 1981 Lincoln Continental Mark VI (base price of $16,858). This was an era before Mercedes and BMW had taken over the top end of the luxury car market and long before the Japanese even had luxury car makes and models (a 1981 Toyota Cressida was as luxurious as it got for a Japanese car back then), so it was safe to say the 1981 Imperial was the high-end of the 2-door luxury car market when it was first released. And it wasn’t just in pure luxury amenities that the Imperial put the hurt on the Eldorado and Continental Mark VI but also in the area of exterior styling. 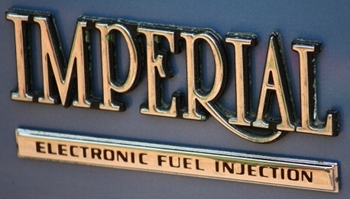 The Imperial used some of the most attractive and sleek exterior styling especially when it came to the front-end design that you were going to find on a luxury car during this era. The Eldorado and Continental’s styling looked boxy and too tame by comparison. It was the Imperial’s very attractive and distinctive looks that not only set this car apart from its competition but have allowed it to age very well. Looking at the 1981-1983 Imperial today you realize it still looks modern compared to the other big luxury cars from yesteryear. Costik points out that "it’s just the best looking car out there, and when I do take it out, it gets attention because of its looks. It’s amazing how many people have never even seen one of these, or can’t remember when they saw their last one. And one is probably all they’ve ever seen." That touches on another reason for the appeal of the Imperial is its rarity. Costik mentions, "there just aren’t that many of them out there, and none as nice as this one. It is a number 1 (condition) car in every respect. I call it a 1.5 because there’s no trailer for me to haul it around on." And even if Costik might be tempted to get a trailer, he provides a good reason not to ever buy one – "but then I wouldn’t get to drive it, would I?" Driving it, is the main reason for this car’s existence, that’s the real fun of owning an Imperial. They don’t make them like this anymore. However the Imperial also represents a bridge from the past to the present day modern luxury car. It has most of the luxury, convenience, and power options that you’ll find on any of the finest modern luxury cars. 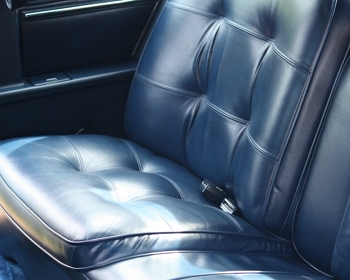 In most classic cars you have to suffer with uncomfortable seats, no or very few power options, and in many cases no air conditioning. With the Imperial that’s not a problem, you have such upscale items as plush comfortable seats, an automatic climate control system, computer controlled readouts, a very good sound system, and power everything: windows, locks, seats, mirrors, etc. In other words if you were stuck driving a 1981 Imperial to work instead of a new 2012 BMW 750 you wouldn’t really feel neglected or cheated. Once you get beyond the fact you don’t have a NAV system or satellite radio in the Imperial you most likely would find your drive to work very pleasurable with the soft suspension with its limousine like ride that absorbs the potholes and rough pavement so very well. Costik sums this up well by saying, "with these cars you have to realize just what you have, and what it was meant to be back in 1981. Keep your expectations right there and you’ll be a happy fellow. The car handles like the 4,000 lb car with a nice smooth, soft ride built for expressways, not mountain roads." He goes on to remark that the Imperial is "a car with all the creature comforts that could be incorporated at the time. The trip computer, very good audio, cruise control, power seats, etc. all add to the package and make it a desirable and pleasurable vehicle to drive and own." Flashback to the mid-1980s to early-1990s, during these years Costik received nothing but reliable service from his 1982 Cordoba, and its 2-bbl equipped 318 CID V8. However it was the more luxurious nature and the more "striking appearance" (as Costik mentions) of the Imperial that finally pushed him towards a quest to find one. The search ended in 1992 when Costik purchased a white 1982 Imperial which for having 10 years of road duty was in pretty good shape. The interior merely needed a good cleaning however some minor body work was also needed most of which consisted of the replacement of the front and rear bumpers. Fortunately the bumpers were available at any Chrysler dealership parts department back then unlike today where they are a very hard find. After this minor work was completed, Costik says "oh, a happy guy I was until the ever-present EFI gremlins crept in. I was able to do most repairs on my own by following the service manuals, but eventually they became too numerous and it got traded-in eight years later. I really was sad to see this happen because it was such a nice car in many other ways." Unfortunately Costik was not alone in his EFI troubles, with the EPA mandated Corporate Average Fuel Economy (CAFE) standards putting a real pinch on American automakers during this era the big three automakers were pushing new computer based technologies out the door before all the bugs were ironed out. Cadillac for the 1981 model year released the infamous Cadillac V8-6-4 (with cylinder deactivation) that was nothing short of a disaster and happened to also be a 1981 Eldorado engine option. 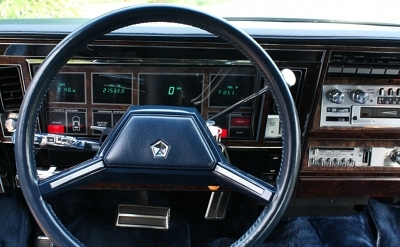 With the 1981-1982 Imperial, Chrysler included the finest in computer controls and digital readouts that this era had to offer. 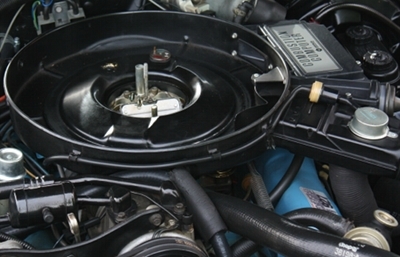 This included a standard (computer controlled) Electronic Fuel Injection (EFI) system on its normally very reliable LA series small-block 318 V8. 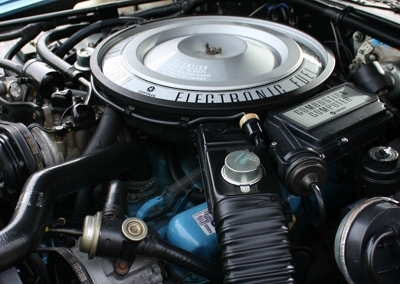 Chrysler on the 1980-1983 Cordoba and Mirada offered an optional 130 horsepower and 230 lb-ft of torque 2-bbl 318 V8 (a 225 CID I6 was standard). In hindsight Chrysler should have made the 2-bbl 318 the Imperial’s standard engine. The EFI 318 produced 140 horsepower and 245 lb-ft of torque but as most buyers soon discovered the extra efficiency, 10 extra horsepower, and 15 lb-ft more of torque that the EFI system provided over the 2-bbl wasn’t worth the trouble. Many Chrysler dealerships just performed the 2-bbl swap for the EFI system when they became tired of working on the plague ridden EFI and dealing with the related customer complaints. It was an easy fix that also kept the owners happy. One sad aspect of this story is that Chrysler did offer a 185 horsepower and 275 lb-ft of torque 4-bbl 360 CID V8 as the top engine option for the 1980 Mirada which would have been the perfect fit to move around town the heavy 3,968-lb 1981-1983 Imperial. Unfortunately due to the CAFE standards, the 360 V8 bit the dust as an option for all Chrysler, Plymouth, and Dodge automobiles at the end of the 1980 model year. There was a 165 horsepower and 240 lb-ft of torque 4-bbl 318 V8 which was available in the 1980-1982 Cordoba and Mirada but only in state of California and for high altitude markets. This would have been the best choice for the 1981-1983 Imperial if it had been available nationwide since it offered good power along with good efficiency. And as luck would have it the original owner of Costik’s second and current Day Star Blue 1981 Imperial also felt this way – he was a Chrysler executive who probably tired quickly of EFI problems and hence swapped in the best induction system available in the Chrysler spare parts bin at the time which was a 4-bbl carb. In essence this gave Costik’s Imperial a nice 25 horsepower boost. Costik comments concerning the 4-bbl are the following, "it is a superior replacement for the EFI, giving the vehicle much improved performance over both my 2-bbl 1982 Cordoba and EFI 1982 Imperial. The change is quite startling!" The best news about this conversion is that Costik’s Imperial has been able to retain the original round EFI air filter assembly which completely covers from view the 4-bbl from onlookers so they still think a fuel injection throttle-body resides under there, giving the impression no conversion was ever done and everything under the hood is 100% original. For Costik that’s important, like many in the classic car community he’s into originality. He comments that "being a purist, I don’t like seeing cars modified, so all of mine have been kept stock." However he also has a pragmatic side when it comes to certain classic cars, he mentons "I would actually like to see a 1957 T-Bird built now with its good looks, with all of the amenities, reliability and technology available now." When his original exhaust system needed the original mufflers replaced he had installed a set of stainless steel mufflers that were OEM style replacements. However the new tailpipe on this new exhaust system deviated from stock so Costik had the muffler shop weld the original exhaust tip on to make it look like it was the original exhaust system. Besides the problem plagued EFI, the only other complaint Costik mentions is the front seats, "one thing I figured out by owning a 1981 and 1982, is that they removed the pillow on the front seats for a reason. They were too thick and made entrance difficult, and I’m 5′ 7”." When Costik was on his quest for his current Imperial he was merely looking for good driver not a perfect survivor. Costik spent a lot of time searching and doing his homework. So when he stumbled across his future Imperial in such nicely preserved condition he knew this car was a keeper and a car he must own. However like many others who have found their special classic cars, sometimes that’s only half the battle. The seller sent Costik numerous photos of the car, both he and the seller also exchanged numerous phone calls and emails before both parties had successfully agreed on a deal both were happy with to get the car to its current home. Costik wisely mentions that the hardest part of the process is trusting all parties involved in the sale and this includes everyone from the seller to the car transporter. The objective is for the car to arrive after the purchase in undamaged condition. With the 1981 Imperial now in its early thirties, you can be assured that its value will rise steadily in the coming years. With collectors now beginning to focus on speciality cars produced during the early-1980s, you can’t find a more unique and beautiful luxury car during this era than the Imperial. And with only 8,113 produced for 1981 (2,717 for 1982 and 1,555 for 1983), there weren’t that many made. And you really begin to grasp the true rarity of these cars, when you consider that the 1981 Imperial which was produced in about 13 different exterior colors, a more popular color such as the Day Star Blue found on Costik’s Imperial was sprayed on only 883 1981 Imperials at the factory. It’s safe to say that at least 60-70% of these and all 1981 Imperials are probably gone and will never return. So you see how you may be searching a long while to get what you want. For those interested in purchasing an Imperial, Costik recommends that you do your homework and research. This means getting to know the vehicle and what you want in detail along with knowing the market, availability, price range, and what you can afford (purchase price and restoration costs if restoration is needed). However most importantly he recommends the following during the car search: "be very patient, and wait until you find what you want. I had several options and took the best one, and haven’t seen a good one since." And once it’s time to close the deal, he recommends "make sure that trust is established all along the way. It is a good trip and fun, if you do your homework." And as with any classic car, finding parts can be a challenge. Costik’s lowdown on parts availability is "the ’81-’83 Imperials are becoming scarce as are the parts specific to the model. There are a lot of common Chrysler parts used on it, so it isn’t too bad yet. But body parts, and interior pieces are scarce, as well as EFI replacements if you want to keep it running." Costik’s Imperial is a representation of one of the best looking, most luxurious, and rare American 2-door luxury coupes to ever be produced. If the Imperial had not had the misfortune of being launched around the time of the 1980 Chrysler bankruptcy, a disastrous U.S. economy, and very stringent CAFE standards – it may have matched in sales or even outsold its competition and stayed around a lot longer. 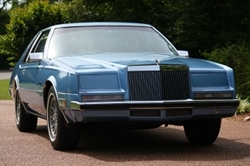 Even though its production was only three years, the 1981-1983 Imperial was still an important pinnacle car for Chrysler – proving it could outdo Cadillac and Lincoln in the 2-door luxury coupe market. Sinatra after driving his new 1981 Imperial for the first time declared "I love it, I love it". And this was coming from a man who during his lifetime owned many of the best luxury cars ever produced, now how could anyone possibly give the Imperial a better compliment? Special thanks to Michael Costik who provided the pictures and information used in this article of his beautiful mint conditioned 1981 Imperial.